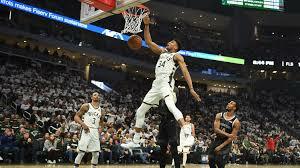 CHICAGO -- Giannia Antetokounmpo and the Milwaukee Bucks made short work of the Detroit Pistons and blew them out of the Fiserv Forum with a 121-86 victory in their series opener on Sunday. It was a fantastic show of force for the best team in the NBA and No;1 seed in the Eastern Conference who finished the regular season at 60-22. Antetokounmpo played just 23 minutes and sizzled with 24 points and 17 boards. All Bucks starters tallied double-figures in points as Brook Lopez and Khris Middleton had 14 apiece and Eric Bledsoe recorded 15 and five assists. Sterling Brown added 11 points. The Bucks, the fourth best team in the league in offensive rating, roared to a 38-18 lead after one quarter of play and built their largest lead of 43 points. Milwaukee swished 48.9 percent of their field goals and hit 15 of 43 triples, one short of their team playoffs high. Detroit, meanwhile, hit only 38 percent of its foeld goals and missed 19 of 27 triple attempts. Luke Kennard registered 22 points to pace the Pistons while Andre Drummond and Reggie Jackson had 12 points apiece. Detroit, seeded eighth in the East, missed the services of All-Star Blake Griffin, who was sidelined by a left knee injury.